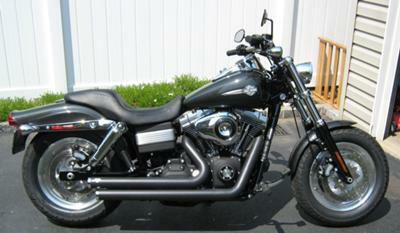 FOR SALE one 2009 Harley Davidson Fatbob Dyna FXDF with only 640 Miles on the odometer. It is MINT SHOWROOM QUALITY! The Dyna Fat Bob's massive stature that is led by twin headlights braced between polished triple clamps, has an unmistakable and impossible to ignore presence on the city street or the highways. Cruising on big tires with an impressive tread pattern mounted on 16-inch silver disc aluminium wheels, the Harley Davidson Fatbob offers its lucky owner a cool and confident ride with plenty of rough and ready performance. New features for this year's model include custom coil-over rear shocks, a stylish low profile rear fender, silver-faced speedometer with range countdown, a black-and-polished Twin Cam 96 engine and BLACK PEAR Alarm. The forward foot controls and flat drag bars offer a relaxed and comfortable riding position. It has NEVER seen rain and has never even been dirty enough to need cleaning; the bike is FLAWLESS, Pristine and all those other adjectives that let potential buyers know that they MUST SEE the 2009 Harley Davidson Fatbob Dyna FXDF to believe it. It comes with extra accessories in addition to being like brand new so, HURRY if you don't want to miss it as I expect this used motorcycle classified ad to generate a lot of interest. I know you must be thinking how crazy it is to have this fine Harley Davidson Fatbob Dyna with less then 700 miles on it for sale plus, I just bought it few weeks ago. But you see, my wife has given me the word that one of us has to go so I am between a rock and a hard place and the FXDF is for sale for a very low $15,500. over priced! you must be smokin crack! i just paid 15500 for my 2011 yesterday sith 0 miles on it, Jack! Yer wife auta keep the bike and get rid of you! I'll bet yours is black and this one has two upgrades including the paint and alarm. You paid 14900 plus tax, minus the two upgrades, the exhaust pipes, fuel pack and Screaming Eagle air cleaner. I bought mine for 14900 so where is the great deal ?????????????????????????? Grab it at this price this bike is hooked up!